(L-R) are Amanda Haag, marketing coordinator; Dave Noggle, RSM; Jeff Gray, vice president of sales and marketing; Al Van Mullen, vice president of engineering; Matt Haven, president; Dean Wolfe, product applications engineer supervisor; and Jerry Sammons, RSM, all of Telsmith. 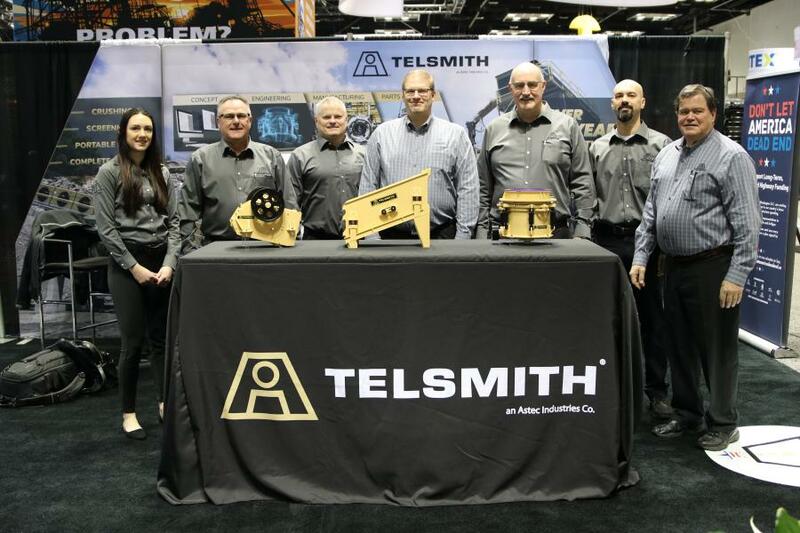 Telsmith Inc., a manufacturer of mineral processing equipment, enjoyed a successful AGG1 2019 in Indianapolis from Feb. 12 to 14 promoting its core product lineup, launching its Crushing Questions campaign and promoting Hire Heroes USA. Telsmith showcased its core product line with 3D models, which included T-Series cone crushers, Hydra-Jaw crushers, and Vibro-King TL screens. The models gave visitors a hands-on approach to learning about the product line. In addition, an interactive touch screen allowed visitors to engage more deeply with the features and benefits of these products. Telsmith's team welcomed visitors and discussed how Telsmith goes the extra mile with their concept to completion services. Telsmith kicked off the Crushing Questions campaign at AGG1 2019. To showcase the Telsmith promise that "The Extra Mile Isn't Extra. It's Included." 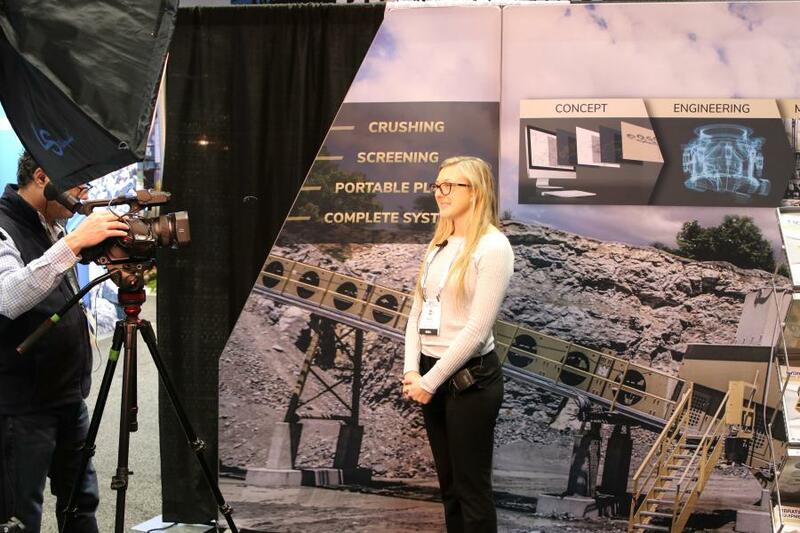 they launched the Crushing Questions video campaign where show attendees asked their most challenging crushing and screening questions. Telsmith collected more than 40 questions from attendees and will answer these questions and share the videos on the Telsmith website throughout the next few months. "We're thrilled to have so many attendees step in front of the camera to ask great questions whose answers offer real value," said Jeff Gray, vice president of sales and marketing, Telsmith, Inc. "We are excited to add these questions and answers to our website and YouTube channel and provide a great resource for people in our industry." In collaboration with Crushing Questions, Telsmith partnered with Hire Heroes USA and will make a donation for every question asked at AGG1. Hire Heroes USA is a non-profit organization that empowers U.S. military members, veterans, and military spouses to succeed in the civilian workforce by assisting in resume development, translating military experience into civilian terminology, interview techniques and more. "There are many veterans within our industry and helping such an important organization such as Hire Heroes USA is one way we can support our men and women who served our country and are ready to transition to a civilian job." Hire Heroes USA is a veteran service organization dedicated to empowering U.S. military members, veterans and their spouses as they seek civilian employment. Services include one-on-one coaching, professionally revised resumes, mentoring, workshops, a job board, career fairs and more. Hire Heroes USA is funded exclusively through public donations and private grants, allowing services to be provided at no cost to clients. Hire Heroes USA has earned a 4-star rating from Charity Navigator and also holds the GuideStar Platinum Seal of Transparency.